Not all your clients are the same shape and size, and while you can’t always accommodate everyone, the kiddies shouldn't always be the ones left out! Pure Spa Direct has several adorable inexpensive cutting capes, that will put a smile on all your younger clients! 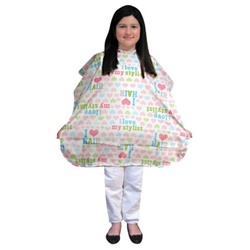 Pure Spa Direct has a variety of inexpensive capes geared towards your younger clients. These capes will make any child feel just as comfortable and pampered as your adult clients and will make their trip to salon feel like a vacation instead of a punishment! Pure Spa Directs selection of Kiddie and Tween Capes offer the perfect cape for any salon. Welcoming your younger clients with a fun Kiddie Cape will certainly put a smile on their face and brighten up their day! Making a child feel comfortable at a salon can sometimes be a little tricky, and having an uncomfortable child in a salon can make everyone else in the salon uncomfortable. This problem is 100% avoidable and would cost you less than $10.00! Choose one of Pure Spa Directs Kiddie or Tween Capes and get those kids smiling as soon as they walk in the door! Pure Spa Direct has a variety of inexpensive capes geared towards the younger clients. These capes will make any child feel just as comfortable and pampered as your adult clients and will make their trip feel like a vacation as enjoyable! Pure Spa Directs selection of Kiddie and Tween Capes offer the perfect cape for any salon. Welcoming your younger clients with a fun Kiddie Cape will certainly put a smile on their face and brighten up their day!